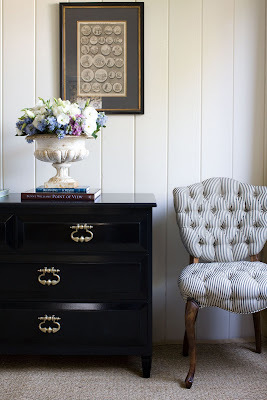 I don't know what it is, but there is just something about black and white stripes...fabric, wallpaper, clothing...obsessed might be an appropriate word choice. 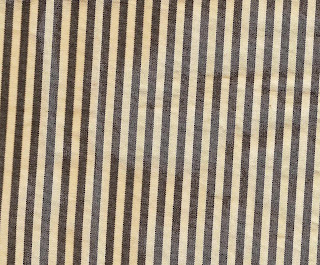 Schumacher's "Tilda Stripe" immediately caught my eye a while back. The proportions, texture, and creaminess of the white (creamy keeps it from looking too mod), makes this stripe practically perfect in every way. When I called to check price and stock I found out that it was discontinued. Sad day. Luckily, they had about 6 yards left in stock, I promptly ordered 3 of those yards to reupholster my shabby little antique side chair. I honestly couldn't have been happier with how it turned out. Soon to be for sale on The Furbish Theory home boutique site. I love love love this outfit. Image borrowed from Sea of Shoes, one of my favorite fashion bloggers. 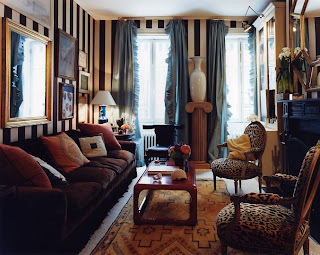 Room by one of my favorite designers, Miles Redd. Love it. I am anxiously awaiting the big Furbish Theory website launch!!! You're an amazing designer and I can't wait to see all of your furniture!!! !